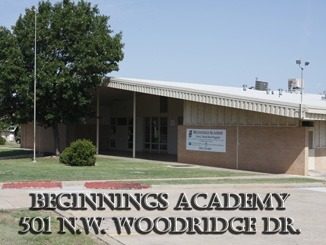 Open enrollment for Beginnings Academy, a Lawton Public Schools and Head Start collaboration, is now underway. The pre-kindergarten center is located at 501 NW Woodridge Drive and consists of nine classrooms headed by certified LPS teachers and teacher assistants. Disability, educational and family services coordinators are also available on-site, as are nurses. All meals and supplies are provided; students should only have proof of physical and dental exams following acceptance into the program. X-Tended Time Program is available before and after school hours. Beginnings Academy is an income-based program but all parents and guardians are eligible to complete applications. Documents needed for consideration are proof of income, shot records and birth certificate. complete applications between 8 a.m. and 5 p.m. Monday through Friday, on-site. Call (580)354-9865 for more information.